Then she throws club again beind back and having caught it goes into round serie of mill with changr of position of body (AV 0,2). Then goes next combination - pvot in backscale, stag leap with turn on 180 and spiral pivot from one leg on 360. 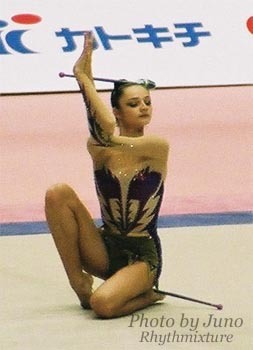 After tat she throws both clubs below leg on normal A leap (AV 0,2) (photo 5) and catches it in backscale (AV 0,2)/ After that she does fish balance with supporting leg bent and doing 3 movements of appratus, cabriol with turn on 180 and 0,4 balance (body parallel to the groun) with doing assymetric work with clubs then (0,1).